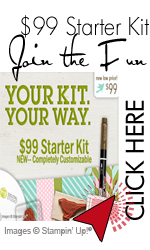 This layout and the idea came from a card my friend and upline, Linda Heller did a couple of weeks ago. But I’m a child of the sixties…I said sixties not hippies so I thought I would add a little 1960’s to the card. I wish it were a VW Van but you can’t have everything. The car does tells the story and the rainbow…well think of it as a headband.